As an engineer, I am seeking to understand the nuanced meaning of "Broadest Reasonable Interpretation of Claims". Is there a generally accepted thought process that one arrives at to arrive at BRIoCs? Concrete \ simple examples are always appreciated. With regard to the diagram above, is it correct to assume that only a single BRIoC is examined by the flow-chart and NOT ANY of the individual claim? The nuanced meaning of broadest reasonable interpretation of a claim is that the examiner will often have a much broader interpretation than the applicant intended. That broader interpretation will allow prior art to show that the claim is obvious. My best examples - One limitation I put on a particular structure was that it was "collapsible". The examiner found something similar that was not collapsible and rejected the claim as not novel. When I interviewed her, she said "everything is collapsable if you hit it hard enough" - BRI. I amended to say "nondestructively collapsible." Your second question regarding all of the claims as a unit - No, the interpretation of each claim depends on the wording of the specific claim. A. Meaning : In the simplest of terms - Broadest Reasonable Interpretation of Claims means, to interpret what the claim(s), in other words the invention is directed and related to. i. One can obtain some US patent nos or application nos at random from google patents or other sources and look for them in Public Pair https://portal.uspto.gov/pair/PublicPair file wrapper. ii. Look for non-final or final rejection communication of office. A few might have faced 35 USC 101 rejection. The first paragraph invariably reads 'the claims are directed to ......' . That is the broadest reasonable interpretation (by the examiner and applicant may differ from him). 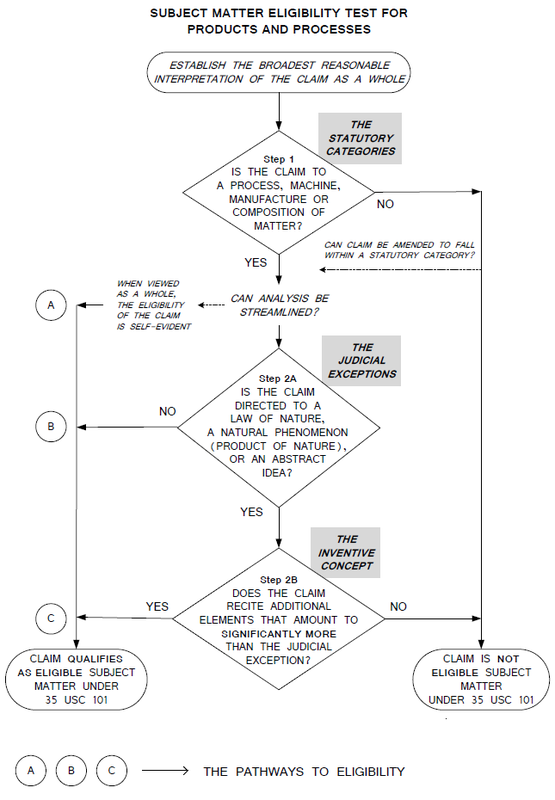 C. Flowchart : BRIoC encompasses all claims interpreted in the light of specification and plain meanings of the words of the claims and determines what the claims are directed to. If disclosure and claims are directed to different inventions (i.e. claims not cohesively related) than those are to be in separate applications (if not done by applicant, examiner will direct for division). D. Individual Claims : These are for scope of protection and for consideration under steps 1, 2A and 2B of Mayo test flow chart. Not the answer you're looking for? Browse other questions tagged mayo or ask your own question.